Vanar Arcanysts used to be the best deck in the game, featuring both incredible early-game tempo and late-game inevitability. It has fallen far from this peak, suffering nerfs to almost half of the deck, but retooled properly it still has enough power to take you far on the ladder. This build focuses on going wide and tempo-based removal in order to set up a swift OTK. Play out your cheaper Arcanysts and make liberal use of Flash Freeze, Frigid Corona, and Hailstone Prison to keep your opponent’s board locked down and your minions alive. Circulus, Illusionist, and Hunter all generate extra bodies, and you’ll want to play out as many as possible while capturing mana tiles in order to set up for the next stage. Owlbeast is the most important card in any Arcanyst list – games go much smoother if you can keep one alive for any appreciable amount of time. If you can play one safely and proc it immediately, it makes your board much more resilient and eats through enemy resources. Cryptographer and Mentor are your honorary Arcanysts, providing extra Kinetic Surges, which do double duty by triggering all your spell synergies. Conjurer is slower, but offers some important backup card advantage. Polarity represents a massive damage burst when used on a high-toughness minion. If you have one live Arcanyst in striking range, you can play an Owlbeast, cast several spells, and finish with Polarity for a game-ending attack. Even if your Owlbeasts have already died, Polarity is still a threat when combined with any leftover Arcanyst with multiple Owlbeast buffs, which can often catch an unwary opponent by surprise. For Firestarter, the most important spell is your BBS. If you’re setting up for this, try hold any extra copies you get from Mentor. Once Firestarter comes down, each additional Kinetic Surge buffs all Spellsparks, which gives you quadratically increasing Rush damage and leaves behind multiple large minions. The main thing to keep in mind here is to position Firestarter correctly so that the Sparks generated can get to where they need to go. This list has no hard removal, so depending what you find yourself playing against, some number of Aspects may be necessary. The most important upgrade is Trinity Wing, in for Conjurer. This list wants to close games out in a quick combo turn, and Trinity’s immediate cheap spells are better for that than Conjurer’s long-term value. I also like Aethermaster slightly better than Prophet for the 2-drop slot. 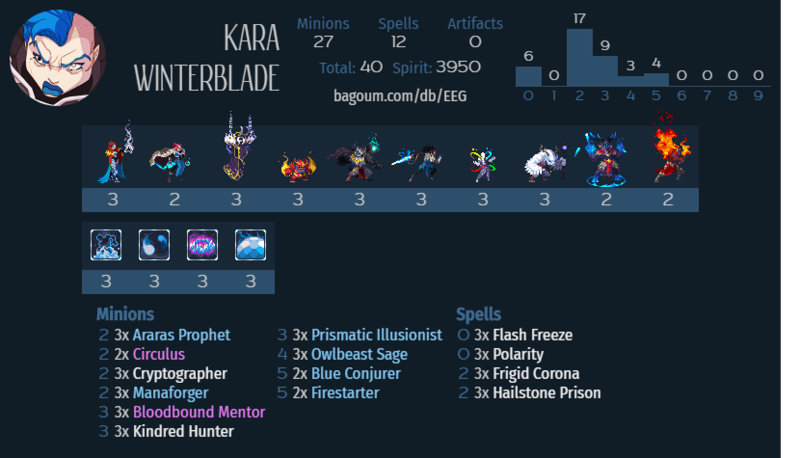 Finally, if you have them, Gravity Well is a Kara staple that synergizes particularly well with this deck, and can replace some of the Hunters.